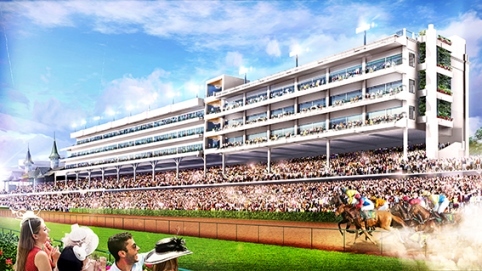 Churchill Downs Racetrack, one of the world’s most renowned sports and entertainment venues, has announced a substantial $37 million capital project that will deliver more than 1,800 new seats for the 2018 Kentucky Derby through the addition of new luxury suites, interior dining tables and third-floor Grandstand seats. The Starting Gate Suites capital project will encompass 77,250 square feet of new space on the north end of Churchill Downs Racetrack’s 147-acre facility. The structure, which will feature three floors of individual suites along with dining and event space, will be erected adjacent to the Jockey Club Suites, which opened in 2003. The new luxury suites, which will feature indoor lounge seating with a bar and a private tiered balcony that overlooks the start of the Kentucky Derby at the top of the homestretch, will host 1,140 ticketed guests. Up to new 36 individual suites will be able to accommodate groups of various sizes. Churchill Downs has 97 existing permanent suites that are an ideal setting for corporate entertainment or small celebrations with family and friends: 15 Finish Line Suites, 62 Jockey Club Suites and 20 Winner’s Circle Suites. Each of the three levels in the new Starting Gate Suites will feature event space with 24 eight-top tables for interior dining for a total of 576 seats. The project also will include the construction of 110 new third-floor Grandstand seats. Foundation work on the construction of the Starting Gates Suites will begin in January and cease prior to the start of the 2017 Spring Meet, which will open Saturday, April 29, so that it does not affect operations during visitors enjoying Kentucky Derby Week. Steel will be erected immediately after the $2 million Kentucky Derby Presented by Yum! Brands (Grade I) is run for the 143rd consecutive year on Saturday, May 6. The Starting Gate Suites project will be complete prior to the 2018 Kentucky Derby. Press release.